Firms need to balance fraud, risk, and security concerns with the need for a slick user experience & fast transactions. 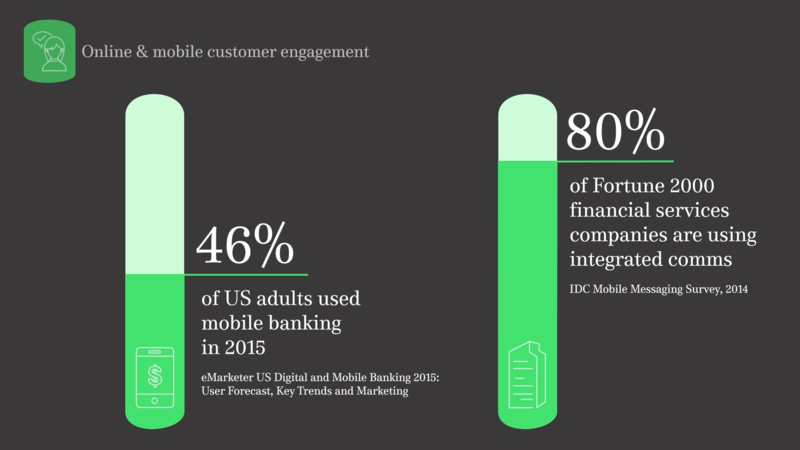 Statistics from the US show that just under half of their adult population used mobile banking in 2015, and up to 80% of financial services companies on the Fortune 2000 are embracing integrated, multi-channel solutions to adapt to the demands of mobility and convenience from their customers. This means that differentiation is crucial to digital engagement, and integrated communications is essential for reaching your customers, wherever they happen to be. Making the most of every channel you use, and creating fast, high-value communications builds a smooth, personalised and powerful customer experience. Online and mobile banking have given fraud and security teams instant, up-to-date information on customer transactions and locations, but that same speed and flexibility is also available to fraudsters looking to hide their activity. Therefore, reporting on communications sent and received is critical. It encourages clear, effective communications, reducing the impact of incidents, and also demonstrates regulatory compliance. Bolstering internal communications to work more efficiently is a must to make sure all business units are in effective contact and can work together to achieve outcomes. Integrated communications reinforces processes and reduces reliance on manual actions – giving better efficiency, higher speed, greater consistency, and lower cost. On-boarding, claims, authentication, enquiries, renewals, and off-boarding communications workflows can all be managed from a single hub, giving business units a coherent big-picture view, and empowering them to be proactive, adapting to changing trends faster than ever before. A great example of the power of integrated communications is in on-boarding new customer loans - usually a high-contact process, which can be costly in both time and resources. Integrated communications makes this process faster, yet still personalized. After the initial consultation, the customer can receive and respond to individual updates on the progress of their application, with customized information based on the type, length and details of the loan – without having to make a physical trip to a branch. Whispir can facilitate this and much more for banking & finance, making your business more responsive, agile, and efficient.